SuzyQ doughnuts is on Wellington West in Hintonburg in the shack that used to house Hintonburger. Opened by a Canada Post mail carrier after her stall at a local famer’s market couldn’t keep up with demand, they’ve got a pretty good thing going. With a yeast-based doughnut dough that manages to be substantial but light and fluffy at the same time, SuzyQ’s real magic is in the imaginative toppings that echo some of the other trends in food like the maple bacon and the salted caramel ones that I sampled today. 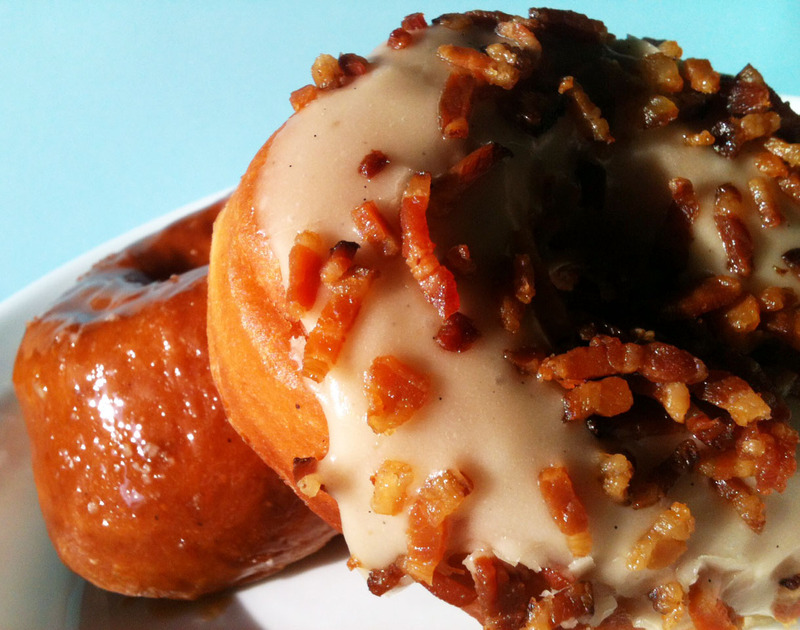 The maple bacon doughnut wasn’t as maple-ey as it could have been in my opinion, with the glaze just mostly sweet but the bacon was cooked and cut perfectly so that it became almost like crunchy bacon sprinkles. The salted caramel had a gooey and buttery caramel coating with a light touch of saltyness that really worked well. I was a bit disappointed that they were out of the other flavour I had wanted to try, Blue Fruit Loop (yes, with the cereal). It’s just a good excuse to make a return trip! Check out SuzyQ’s website at suzyq.ca.